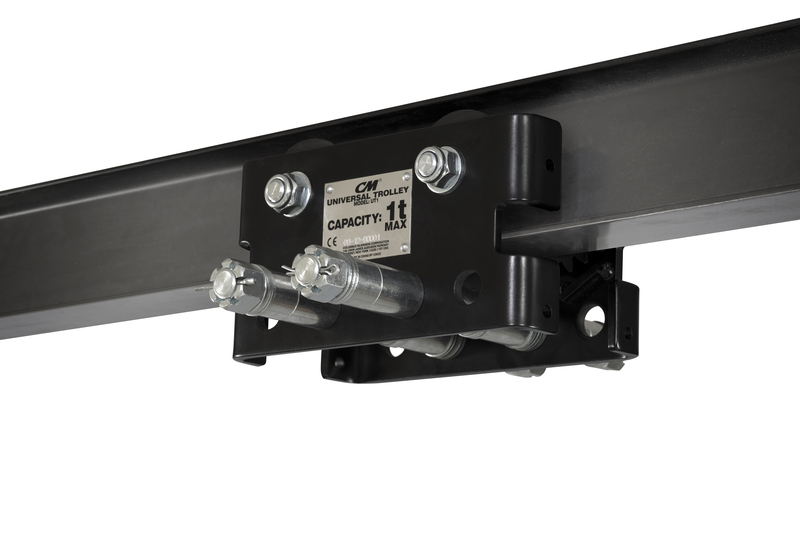 The CM Universal Trolley (UT) is designed to fit virtually all Columbus McKinnon powered chain hoists up to 3 ton capacities. The rugged UT is competitively priced and available as a convertible plain unit, a geared unit ideal for precise hoist positioning, and a motorized unit that’s perfect for applications requiring high cycling and long distance hoist travel. Designed to fit most CMCO brand air and electric chain hoists up to 3 tons, the UT reduces inventory costs while increasing inventory flexibility. With its very attractive price, the ability to be used with a multitude of hoists, and its long service life, the UT offers the greatest value of any trolley on the market today. Plain trolleys equipped standard with geared trackwheels and side plate. Simply add a hand-geared kit to convert unit to a geared trolley in the field. Dual tread wheels fit tapered or flat beams. Wheels include permanently lubricated shielded ball bearings for long life and low maintenance. The UT features wrap-around side plates. Drop lugs provide additional security to improve operator safety and protect the wheels. Castle nuts are pinned to ensure the bolts stay tightened, increasing operator safety. Zinc-plated bolts, nuts and washers along with painted frames protect against corrosion and wear. Ensure a better fit to the beam for smoother operation and longer life. Plain trolleys allow for manual positioning of hoist and load, while geared units are ideal for applications where precise positioning is required. 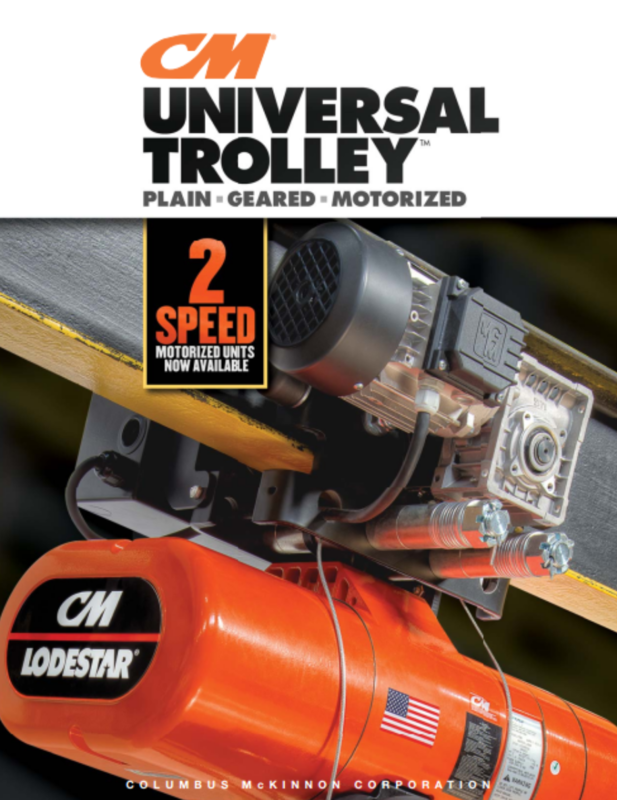 CM UT geared trolleys feature standard hand chain drop in proportion to a 20-foot-lift hoist. 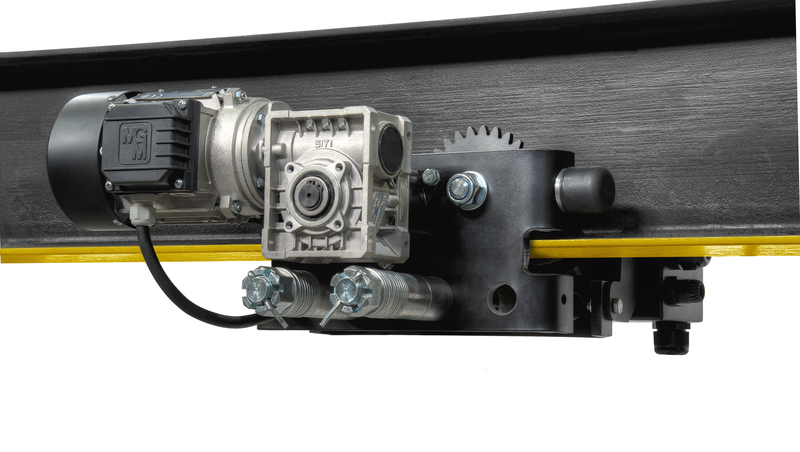 Motorized Universal Trolleys are best for applications requiring high cycling and long-distance hoist travel. AC POWER SUPPLY – Standard Single Speed: 208-230/460,575V 3-60 HZ, 3-phase. Optional 2-Speed: 208, 230, 460, 575V 3-60 HZ, 3-phase. OPTIMAL LOAD CONTROL & SAFETY – For gentle starts, greater load positioning accuracy, and to minimize load swing, choose the optional 2-speed unit featuring a 4:1 speed ratio and 3-phase single voltage. EASY ACCESS CONTROL BOX – Control box design allows the entire cover to be removed for easy access to components. Box has a white background for increased visibility and cover can be used as a tray to hold tools when servicing the unit. WEATHER-PROOFING – NEMA 3R Control Box Enclosure.